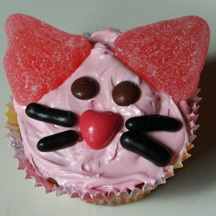 Already-pink frosting and candies makes these pink kitty cupcakes extra easy. What You Need: 1 cupcake; pink frosting (strawberry and other pink-tinted frosting is sold in the can in the baking aisle, or use dye); 4 candy-coated licorice pieces; 2 brown mini M&Ms; 1 heart-shaped pink candy (ours is a Runt); 2 sour grapefruit slices. How to Make It: Frost cupcake. Add candies as shown for eyes, nose, whiskers and ears. There’s your kitty!